A year ago I had a look at which posts were (still) being visited, and to a limited extent which topics were apparently more in vogue than others were. In short: some old posts were still receiving visitors and posts about my research comparatively less. 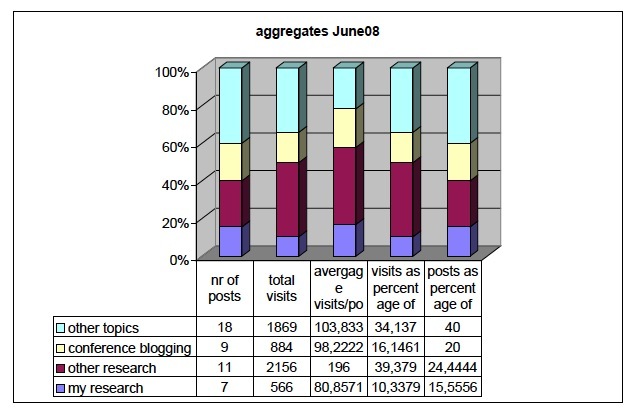 Data analysis, however, may have been hampered by the low amount of posts (32) and visits (3254) and the age of the blog. I did check again in December ’08 and yesterday: now I have 62 posts with 7886 hits to the individual posts and 12682 overall, so things are going upward. For what it is worth: still some old posts are receiving visitors regularly, posts about my research comparatively less–but slightly better now–and posts about other people’s research is second to none. 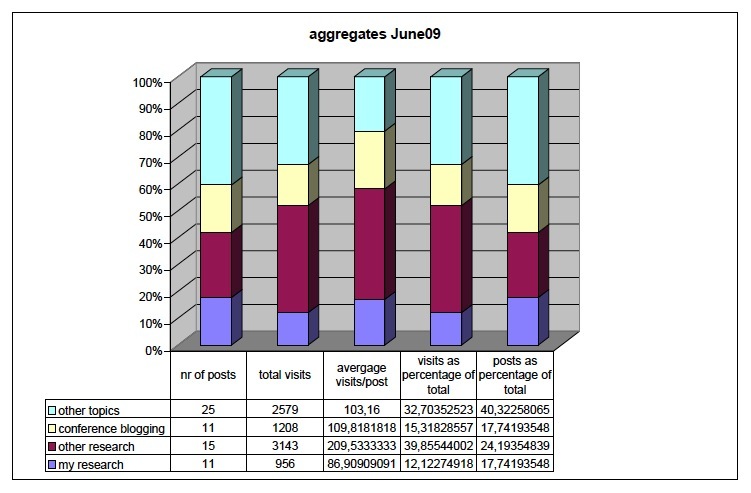 More precisely but aggregated (raw data available upon request), in June’08 the average-visits/my-research-post was 80.9, now in June’09 86.9, compared to 196 and 209.5, respectively, for the average-visits/other-research-post, whereas the percentage for the former went up from 10 to 12% of total visits (stable on 39 for ‘other research’). The two other main categories, ‘conference blogging’ and ‘other topics’, hover little above 100 for average-visits/post. Interesting to me was to observe that while the ‘other topics’ posts are largest in number, on amount and average visits it hands it over to ‘other research’ (the other two remaining roughly stable), and that I actually had published much less posts about my own research results than I thought (a mere 11 posts out of the 62). Perhaps I’m too hesitant to do all the shameless self-promotion; the research results and projects are there. In case you would like the know which posts received most hits over the past three years, check out the vox populi page (it corresponds roughly with external linking and search terms). Ontology design is still more of an art than a science. A methodology, Methontology, does exist, but it does not cover all aspects of ontology development. Likewise, there are tools, such as Protégé and the NeOn toolkit, that make several steps in the whole procedure easier. But, with the plethora of resources around, where should one start developing one’s own domain ontology, what resources are available for reuse to speed up its development, for which purposes can the ontology be developed? The novice ontology engineer would have to go through much of the extant literature, read case studies and draw their own conclusions on how to go about developing the ontology and/or also attend ontology engineering courses or summer schools, which is a rather high start-up cost. To ameliorate this, but also to save myself from repeating such information informally, I gave it a try to condense that information in, effectively, 4 Springer-size pages [pdf] (plus 1 page intro and 1 page references) . The paper contains a grouping of input parameters that determine effectiveness of ontology development and use, which are categorised along four dimensions: purpose, ontology reuse, ways of ontology learning, and the language and reasoning services. The paper has several examples taken from the agriculture domain by having build upon experiences gained in previous and current projects and related literature. It is noteworthy, however, that development of agri-ontologies is in its infancy. Then, for a relatively seasoned ontology engineer, most, if not all, parameters may be known to a greater or lesser extent already, but from the intended audience perspective, the paper was deemed to be a timely, much needed, and useful overview. My impression is that those reviewers’ comments say more about the knowledge transfer—well, the lack thereof—from one discipline to another than about the modellers and domain experts. For those of you who are interested in agri-ontologies and would like to know more about the latest developments in that area, there is the (third) special track on agriculture, food and the environment during MTSR’09 in Milan 1-2 October. Keet, C.M. Ontology design parameters for aligning agri-informatics with the Semantic Web. 3rd International Conference on Metadata and Semantics (MTSR’09) — Special Track on Agriculture, Food & Environment, Oct 1-2 2009 Milan, Italy. Springer CCIS. to appear.